Australian’s love their sports. For parents, there is nothing quite like watching your little people running about a footy field or netball court with their mates. However, this joy can very quickly turn to devastation if we witness an injury – especially a preventable one! Any sport with a risk of contact, comes with a risk of a facial injury. Broken jaws, split lips, cracked and missing teeth aren’t just painful, but often involve lengthy and very expensive treatments, sometimes needing life long maintenance. Fortunately, we can prevent and reduce the severity of many of these injuries by wearing a properly fitted mouthguard. So what should you look for in a mouth guard? Firstly, a mouth guard needs to be well fitted. The guard should cover all top teeth, and extend under the top lip as well. This ensures that it also protects the roots of the teeth. The tight fit should allow the wearer to still speak, and keep the guard in place so it doesn’t obstruct breathing, or risk falling out. Over the counter “boil and bite” mouthguards do not provide the same protection to the wearers teeth as professional custom fitted mouthguards. They are loose, often impede breathing and speech, and if dislodged, may even be life threatening if wedged in the back of the throat. For these reasons, the Australian Dental Association recommends the use of professional custom fitted mouthguard in preference to the Boil and Bite type. Professional custom fitted mouthguards are made by your dentist. By taking moulds of your teeth, your dentist can ensure that your mouth guard is fitted properly. This results in a more comfortable guard, that resists movement, allowing easier communication, and breathing. The better fit leaves the player with less distractions, and allows them to focus more on their game. They are made from a tough thermoplastic material that tastes and smells completely neutral. To keep your mouthguard in great shape, make sure to clean it after use with cold water. Never store it in direct sunlight, or a hot car – this can distort the fit. Remember to take your mouthguard to your regular check ups, so your dentist can check the fit, and be certain that it is still working effectively. Lastly, mouthguards need to be worm whenever there is a risk of contact – even during training sessions! 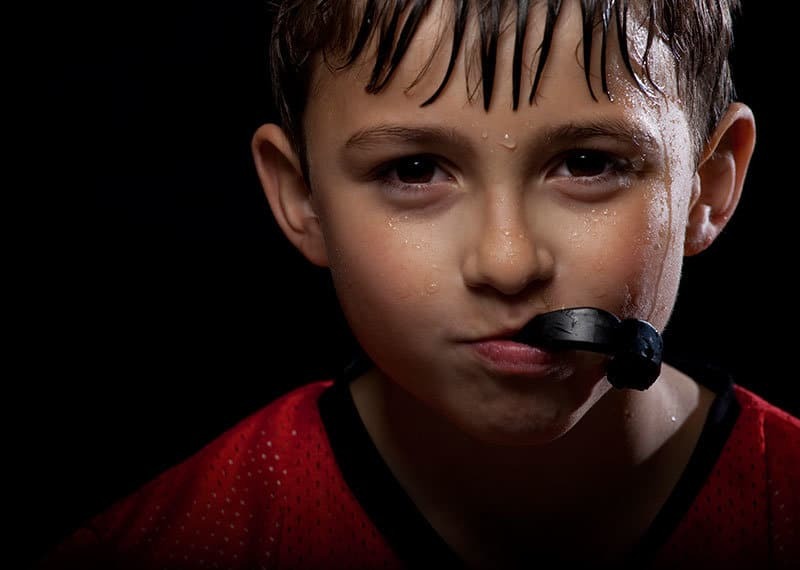 Here at Dental Care On Pulteney, we want to do everything we can to make sure your child grows up with a healthy and fully intact smile which is why we thoroughly recommend professional custom made sports mouthguards.